Here it is, Thursday afternoon, and here is Rabbi Les Scharnberg, pawing through the orphaned books on the free-table at the Arcata Community Recycling Center and gabbing with fellow book scroungers. “I’m a compulsive reader,” Scharnberg says. “So am I,” says Rochelle Trochtenberg. They lift books, put them gently down. They seem immune to the raucous clatter-clink of crashing bottles and cans, the pervasive alley-stench of stale orange juice and sour wine. Hmm, perhaps these aren’t the right people to tell about the chopper. But they only look fleetingly concerned at the news, then resume culling: for Scharnberg, Tony Hillerman’s “Sacred Clowns,” John McPhee’s “Assembling California,” and Sam Keen’s “Fire in the Belly”; for Trochtenberg, several books on house plants and “Shopgirl” by Steve Martin. They barely make a dent. Yard supervisor Ben Winker, wandering over, says many of the books have been here for weeks. Some will go inside to the ACRC thrift store, either to the 25-cent shelf or the shelf of individually priced books deemed higher quality. Some will go to the chopper. They can’t keep everything. “Space is our biggest issue,” Winker says. St. Vincent de Paul drops off about 1,000 pounds a week. The Eureka City Schools brought in 6,000 pounds last Monday — they’ll be back in two months with more. The county libraries dump a ton a month. Many books go across the street to a warehouse. Others are piled into a gigantic barrel — free pickings, if you can reach them. This pick-and-choose method infuriates some people. 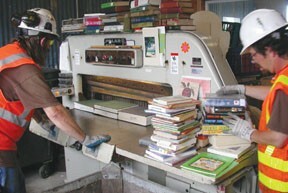 In an interview last winter, Arcata resident Patsy Givins — a booklover who also sells books online — said she wished the recycling center would make more space for books and hire a librarian to judge their worth. Inside the chopper room, employee Julius Huck lifts several heavy medical tomes circa 1968, dropped off by HSU, and lays them spine-first against the blade of the three-ton Polar Mohr, a metal behemoth (also circa 1968). Huck pushes a button — crunch, the pages separate from their covers. He tosses the landfill-bound covers in one garbage bin, and the pages — which can be sold as recyclable “office pack” for $170 a ton — in another. Huck loads more books. Pushes the button. Crunch. Loads more books.